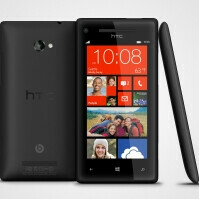 HTC has apparently been planning to take the big screen fight onto the Windows Phone 8 turf, which might explain why its current HTC 8X flagship there was outed with a "just" 4.3" display. The company has reportedly been planning to inject WP8 into something like the Droid DNA chassis, which sports 5" Full HD screen, but Microsoft dropped the ball on 1080 screens support in Windows Phone 8, which currently only goes up to 720 horizontal resolution, reports Bloomberg. The Taiwanese decided that a big-screen WP8 device thus won't be competitive against the upcoming Full HD 5-inchers that Android makers have in the pipeline, and scrapped its plans for such a device altogether. Agree...There's so much you can do without a full HD display... That's what phones have been doing before the DNA. Off topic : do you own lumia 920? If so how does it feels? Coz I thinking of wanna own one as my 1st wp8... Is it good? prepare to be thumbed down lol but seriously the 8X feels better in the hand than 920. Lol, i'm convincing you??? Really??? Haha...well that's some news! Yes, L920 is better than 8X in terms of the features inside it! But note this, i never said that it fells better in the hand than the 8X or any other phone! I agreed with you, no matter how a phone is better in hand, what matters most for majority of consumer is features and specs. Nope, don't have one in my hand Wendy, but i'm not talking about L920 here, i'm talking about displays. Well my bf has had a Lumia 920 for a few weeks so ive used it a bit and its really not that bad in the hand. Maybe its more my taste; I like slightly heavier phones because I like the feeling substance but I can see how it might be too heavy/bulky for some when compared to lighter phones. But overall I think it fits nicely and is easy to handle. Definitely a fast phone, and is very enjoyable to use. However, my phone is a GNex on 4.2.1 so some of the customizations/power features are lacking but I'm not too much into all that. Im really liking WP8. Definitely a good phone and I'd seriously think of getting it, especially if coming from an iPhone, like my bf. What??? And you have a Pokemon???? Tell me your avatar is not lying!! PA, goes up to 720 horizontal pixels is theoretically incorrect. It supports 768 horizontal pixels. Yo, when was 720p never enough for your eyes to distinguish texts???? it was, but more pixels= better details.. soo yeah, i would prefer the 1080p screen, maybe after 2 years we'll have 4K screen on the SVI, we'll see. I'm not against 1080p displays, but talking down resolutions below it is not so wise either. The phone is not 5 inch so 720p is quite enough...that's what i'm saying! Enough is not enough in technology world if everybody was thinking like you we would be still using flip phone with no camera because that was enough then. Again, i'm talking about displays BELOW 5 inch...in case you missed it. MS may add support for full HD displays in upcoming service pack update...for now...just have to live with 720p. This makes me made. People buys phones judging by it's specs and hardware. If you can do better you will win. If manufacturers made Quad core, 2GB Ram, 13mp camera windows phones they would've sold well. I know wp performs well with a dual core chip and 1GB Ram but this doesn't attract people. That's why they choose Droid DNA and Note 2. And more capable hardware also make phones futureproof. And Nokia's stupidity relying on a single closed source operating system is definitely getting them out of the business. Nokia is dying because of MS and elop. Unless they will switch to android they will be dying slowly and slowly. There is only 1 phone currently in the u.s supporting 1080p (DNA) so at this time most of ur argument is irrelevant. That's too bad. I supported HTC and their WP efforts but stuff like this makes me wanna say its time for MS to invest heavily in Nokia and their surface phone and leave HTC to struggle with Android. If I could I would ask HTC, what is the resolution on the Gnote 2?